A relic is an object associated with a saint that may be offered to the faithful for veneration. Since the soul of a saint is united with God in heaven, an object associated with a saint is meant to draw a person closer to God. First Class: A physical part of a saint, such as a piece of bone or a lock of hair. The heart of St. Jean Vianney was taken from the saint’s body after his death in recognition of his burning love for God and humanity. It has remained intact, or incorrupt, for more than 150 years. Second Class: An object routinely used or touched by the saint during life, such as a piece of clothing, a book or a pen. Third Class: An object that is reverently touched to a first-class relic. No. The teaching of the Church is very clear that Christians are never to worship anything or anyone other than God — Father, Son and Holy Spirit. Relics are venerated as holy objects that are associated with saints who now live in God’s presence. A relic is venerated in recognition of the fact that God has worked through a saint, and that an object associated with a saint is holy and can lead people to God. The healing power of relics comes from God alone and never from the object. Reference to an early form of relics can be found in the New Testament, when a woman was healed by touching the hem of Jesus’ garment (Mt 9:18-26) and when cloths touched by St. Paul were used to heal the sick and drive out demons (Acts 19:12). A more developed use of relics began during the persecution of the early Church, when the faithful would retrieve the bones of martyrs and place them under the altar for Mass. To this day, Catholic churches place first-class relics in altar stones. A reliquary is a special case that holds a relic. It may be small enough to fit in a hand or large enough to encase a saint’s body. Who made the painting of St. Jean Vianney that is traveling with the relic? The painting, or religious icon, was commissioned by the Knights of Columbus for this tour. The original was painted by Italian iconographer Fabrizio Diomedi and copies have been made to accompany the relic. The Shroud of Turin. The chains of St. Peter. The head of St. Catherine of Siena. These are all famous relics of the Catholic faith most people instantly recognize when they hear the words. However, these are relics that most people may not get to see in their lifetime. But one relic is coming to Albany that you can get to see up-close and personal. On Friday, April 26, the Incorrupt Heart of St. Jean Marie Vianney, the patron saint of parish priests, will be on view at the Cathedral of the Immaculate Conception in Albany from noon to 7 p.m. The relic is on a national tour and has been entrusted to the Knights of Columbus by the Shrine of Ars, France. The tour began on Nov. 10, 2018 at the St. Mary’s Spiritual Center and Historic Site in Baltimore and ends at the Basilica of St. Peter in Columbia, S.C., on May 27. But who was St. Jean Vianney, the Curé d’Ars (the parish priest of Ars)? When did he live? Die? And what is it about relics, from a piece of clothing to a body part, that has been intertwined in the Catholic faith from almost the beginning. St. Jean Vianney was born in Dardilly, France, which is near Lyon, on May 8, 1786, during a terrible time for Catholics in France. The French Revolution was in full swing and people of faith were under attack; churches were destroyed. A young Jean had to receive his First Holy Communion in secret. But that only steeled his faith and it led him to enter seminary. But he was nearly kicked out, struggling with his studies, in particular Latin, until the vicar general, who was told of his great piety, interceded and Vianney was ordained in 1815. In 1818, he was assigned to the small, farming town of Ars; with a parish of just 260 people. Even though people had strayed greatly from their faith, Vianney was undaunted. He was known to spend up to 18 hours a day hearing confessions, and built orphanages for homeless children. Pilgrims from across Europe would come and wait hours to see Vianney, who has known for his gift of reading hearts. Vianney died on Aug. 4, 1859, at the age of 73. On Oct. 3, 1873, Pope Pius IX proclaimed him Venerable, and on Jan. 8, 1905, Pope Pius X beatified him. St. Jean Vianney was canonized by Pope Pius XI on May 31, 1925. In 1929, the Holy Father declared him patron saint of parish priests. His feast day is Aug. 4. Cullen added that with the priesthood and the Church struggling to come to grips with the sexual abuse scandal, Vianney is an example to how to live a saintly life. Cullen added when the relic has visited seminaries, there is an instant connection. The St. Jean Vianney relic is just one of thousands that are central to the story of Catholic Church, including St. Paul’s Chains, St. Thomas’ finger, the body of St. Francis Xavier, Goa, the blood of San Gennaro and Mary’s Holy Belt. Relics are broken down into three categories. A first-class relic is an item directly associated with Jesus Christ’s life, such as a manager or cross, or the physical remains of a saint, i.e., bone, hair, limb. Vianney would fall into this category. A second-class relic is an item a saint would have owned or used, such as clothing, a crucifix, rosary or book. A third-class relic is touched by a first- or second-class relic, such as a piece of clothing. It might seem odd to some to venerate an ear, a heart or a piece of clothing, but Father Barratt says it all makes perfect sense. We do it in our everyday life, he adds; it’s all about connectivity. For Vianney, it’s the heart. “We have that whole image of the heart, it is a very biblical, very scriptural image,” Father Barratt said. “The heart is really what motivates us and drives us. It is not just the organ that pumps blood around the body; it is a symbol in both the Old and New Testament. 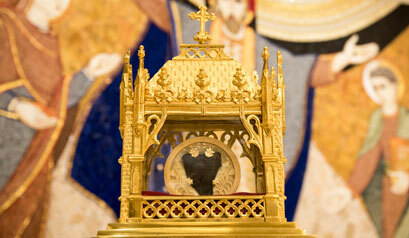 Relics, such as the heart of St. Jean Vianney, are never to be worshipped, but used as a means to get closer to God.